One of my favourite things about Twitter is the fact it’s such an open platform. Yes, that means trolling is an issue but on the other hand, the opportunities are endless for making new connections, helping people and spreading positivity. Everyone loves surprises, right? With this in mind, so many local businesses are missing a trick – it’s such a simple thing to do as well. Imagine you’re in a city centre, it’s a frosty Winter morning and you’ve tweeted about how cold it is – a few minutes later, a local coffee shop has tweeted you asking you to come in for a coffee (their shout!) to cheer you up. How cool would that be? You’re going to tell all your friends about it and next time you’re in town, you’re definitely going to go back there. It’s such a simple thing to do too but Twitter’s Advanced Search function isn’t that well known for some reason and it’s massively under-used. There are a range of search options – you can include or exclude particular words or phrases, choose hashtags, the language, tweets sent to/from a particular account, when, whether the tweet was positive/negative or contained a question and also, most importantly for local businesses, you can choose the location where the tweet was sent from (with a default search radius of 15 miles). 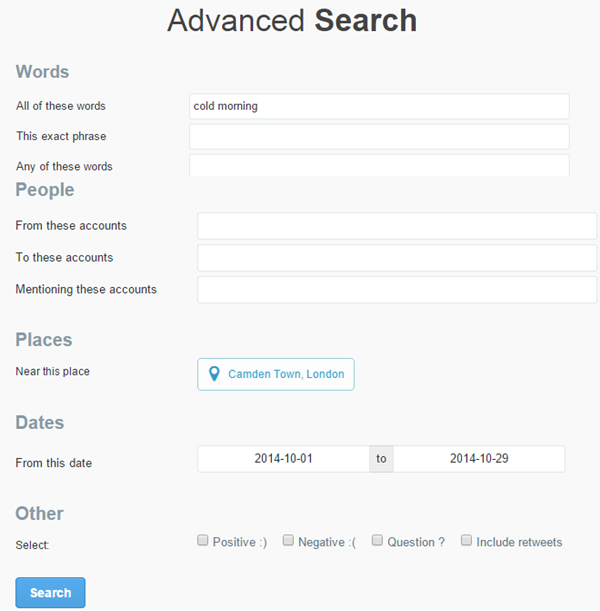 Looking at this really simple search above, we can find a number of people who’ve mentioned the words ‘cold’ and ‘morning’ within a 15 mile radius of Camden Town, London. Camden coffee shops, are you paying attention? Here’s some examples – and they were all posted in the last 24 hours! If you want to get even more specific with your location targeting, or you’d like to increase your radius, you can actually search for tweets based on their longitude and latitude, with whatever radius you like. To do this is also pretty simple but you’ll have to craft your search query and pop it in the normal search box on Twitter instead. The first part (“need coffee”) is the search keyword, the second part (-RT) excludes retweets which makes it easier to see the original tweets for you to reply to, finally the geocode finds the location of the tweets based on their latitude and longitude (and the last bit after the comma is the radius, 50km, which you can change to whatever you want). As you can see, the level of detail that can be included in a Twitter search allows you to find people who are tweeting literally about anything, anywhere. The only limitation is your own imagination – if you’re running a local business, you have this great opportunity to create a buzz, brand advocates, and repeat customers for your business, quite literally for the price of a cup of coffee! If you have any questions or need any help creating your search queries, leave a comment below and we’ll help you get started.